Everyone in Chiang Mai, Thailand, knows Tua, the 10-year-old "peanut". While her mother works day and night, Tua visits the bustling marketplace. One day, as Tua explores the market, she discovers a hole in wall. Curious, she steps through the hole and is swept away a stream of people. The stream becomes a river that carries her into an exciting adventure. In the center of the city, Tua stops a fountain in a square. There, bungling two mahouts with a young elephant draw a crowd of the tourists who give money to the elephant. The elephant, in turn, gives it to the mahouts. The mahouts then give the tourists fruit to feed the elephant. Ah, a happy arrangment. Or is it? At least Tua thought so until the elephant takes the money and instead of giving it to her handlers, turns to give it to a poor woman who is begging in the street. Tua sees mahouts' surprise turn to anger as they drag the young elephant away, beating her mercilessly on the legs and yelling that she will not get fed tonight. The poor elephant beckons for Tua to help as she is led away. Tua follows at a safe distance to their camp, all the while wondering what she, a young girl, can possibly do to save this abused young elephant? Can you believe it, she steals the elephant? Then, she realizes how difficult it is to hide an elephant, even this small elephant! Luckily, Auntie Orchid has some clever ideas up her theatrical sleeves! Will Tua and Pohn-Pohn reach the elephant sanctuary before the two sinister mahouts catch them? Tua and the Elephant will delight you with its colorful figurative language, its exciting plot, its interesting characterzation, and authentic exotic setting where Thai food, language, culture, and elephant rescue. The 49-page Kids Wings unit provides opportunity for discussion, drama, honing of reading strategies, writing, solving a crossword puzzle, research, and more. In addition, a 50-page Jeopardy-type game challenges the class to compete in interactive fun. 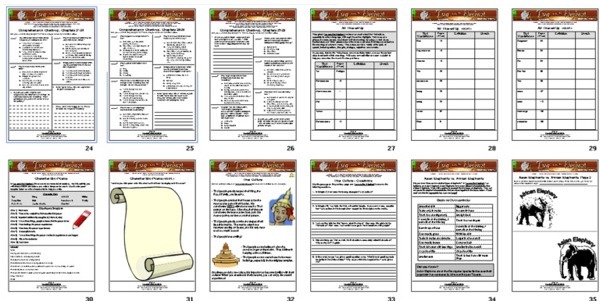 A 49-page Kids Wings Literature Guide PLUS a 50-slide interactive Jeopardy-type game, perfect for lesson plans, handouts, or projection on your SmartBoard for Tua and the Elephant by R. P. Harris are now available for instant download! Dig Deeper! Talk About It! Write About It! All Thai-ed Up! Exploring the Thai Language! Where in the World is Southeast Asia? PLUS a 50-Page Jeopardy-type game! 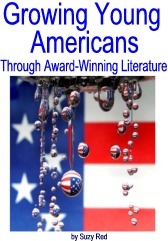 Tua and the Elephant is one of the 26 literature guides in Growing Young Americans. While you can purchase the individual literature guides for about $12.95, if you order Growing Young Americans, you can get the entire collection in a spiral-bound book with CD and site license for one school and pay less than $2 a unit in the collection! A special thanks to the talented Curtis Schweitzer for allowing us to use his symphonic composition, "The Marketplace" as our background music! Buy Tua and the Elephant NOW!